As the above links demonstrate, there are several methods of employing astro navigation to calculate your position in a survival situation. The crucial data that is required for these methods is the altitude of a celestial body such as the Sun. In an ideal situation, we would use a sextant or similar angle measuring instrument to measure the altitude of an object but obviously in a survival scenario it is highly unlikely that we would have access to such heavy, cumbersome and expensive equipment. However there is a method that enables us to calculate the altitude without actually measuring the angle. To understand the method, we need to think about the simple ‘shadow-stick’ experiment which is often practised in school maths lessons. 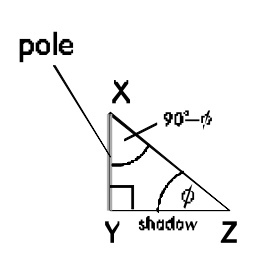 As shown in the diagram below, if we put an upright pole in the ground when there is bright sunlight, the pole, a ray of sunlight and the pole’s shadow give a right-angle triangle in which, angle ø is equal to the altitude of the Sun. If we measure the height of the pole and the length of its shadow, we will have the lengths of two of the sides of the triangle and these are respectively the opposite and adjacent sides to the angle ø. The opposite side divided by the adjacent side will give us the tangent of angle ø and the inverse of the tangent will be equal to the altitude of the Sun. Using the trig tables, we see that the inverse of tangent 0.65 = 33o. So the altitude is 33o. Example 1. Calculate your latitude. Scenario: Date: 20 November. Location: Lost somewhere in the Sahara Desert (possible latitude 15o to 30o north). Step 1. You place a straight stick in the ground making it as upright as possible. Step 2. You measure the height of the top of the stick above the ground and find it to be 0.9 metres. Step 3. You use a magnetic compass to check the direction of the stick’s shadow at frequent intervals until it bears north. At this point, it will be noon. Step 4. You measure the length of the shadow and find it to be 0.8 metres. Inverse of tangent 1.125 = 48.36o. Therefore altitude = 48o to the nearest whole degree. Step 7. You calculate the latitude as follows: You know that the Sahara is in the northern hemisphere and that in November, the Sun is over the southern hemisphere. So the formula for calculating the latitude when latitude and declination are in opposite hemispheres is: LAT = (90o – ALT) – DEC so, using the measurements above, the calculation becomes: Latitude = (90 – 48) – 19.6 = 22.4 north. Scenario: Date: 30 September Location: Shipwrecked on the west coast of Namibia. (18o to 28o south and 13o to 17o east). Task 1 – Calculate Latitude. Step 1. You place a pole in the ground making it as upright as possible. Step 2. You measure the height of the top of the pole above the ground and find it to be 3.6 metres. Step 3. Using a magnetic compass, you keep checking the direction of the stick’s shadow until it bears north. At this point, it will be noon. Step 4. You measure the length of the shadow and find it to be 1.2 metres. The inverse of tangent 3.0 is 71.56o. Therefore altitude = 71.5o to 1 d.p. So latitude is 21o south to the nearest degree. Task 2 – Calculate Longitude . One of the survivors has a wrist watch which is still in working order. The watch would have last been set to the zone time kept by the ship before it was wrecked. Since the ship was travelling down the west coast of Namibia its longitude would have been approximately 13o east so the zone time would have been -1. Step 2. Calculate time difference. You have calculated that at noon local time, it is 11.08 GMT so the time difference is 52 minutes. Step 3. Calculate difference in longitude between the Greenwich Meridian and your position. You know that in 1 hour, the Sun moves 15o so in 52 minutes the difference in longitude will be (52/60) x 15 = 13o. Step 4. Calculate longitude of your position. Using the rule GMT Least, Longitude East, you calculate that your longitude is 13o East. Therefore, your latitude and longitude are 21o south, 13o east. It could be reasonably be argued that just as a sextant is not likely to be in the possession of someone in a survival situation, neither are a ruler, a calculator and an almanac. However, a typical survival kit includes a compass, map, matches, first-aid pack, water etc. It would make sense to include a small tape-measure and two printed pages containing trig ratios such as this and the Sun’s declination such as this. These three small items are all that are required to calculate the altitude of the Sun using the method described above. (If a straight pole cannot be found the shadow cast by an upright person would do just as well). A fuller explanation of this topic is given in the books ‘Astro Navigation Demystified’ and ‘Applying Mathematics to Astro Navigation’. This entry was posted in Uncategorized and tagged astro navigation, celestial navigation, mathematics of astro navigation, survival - astro navigation. Bookmark the permalink.